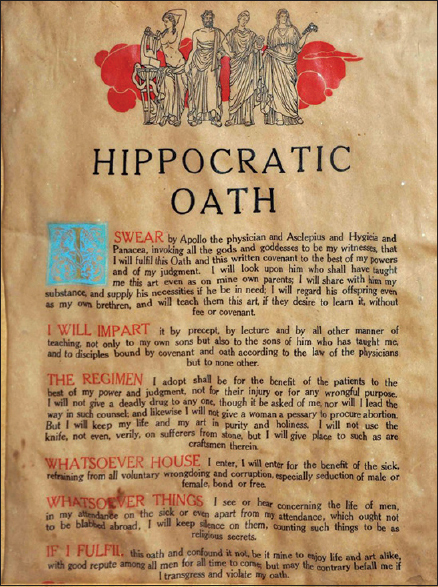 It is believed that either Hippocrates, considered as the father of medicine, or one of his pupils wrote what is popularly known as the Hippocratic Oath, a solemn oath known to be taken by people in the medical profession, doctors in particular at least. The medical profession was long considered the noblest, with doctors often compared to gods and angels. Yet, looking closely at the profession today, its foundation of ‘do no harm’ has been eaten into by some of its greedy members. And they continue to thrive in the wake of the damage they do. A year or two ago, I heard the story of a person in Mumbai who was suffering from a knee problem. He consulted a well-known surgeon, who, very emphatically stated that the condition was serious, recommending urgent surgery. The surgeon asked if he should book the operation theatre at a hospital he is associated with, for a few days later. The patient panicked, but gathering his nerves, said that being a religious man, and would like refer to his religious calendar at home for a good day for surgery. The doctor, unfazed, lifted the receiver on the telephone at his desk, and muttered something in to it. Next moment, almost magically, his secretary appeared, a few religious calendars in hand for the patient to refer to. While the pressurizing to fix a surgery date continued, the patient barely managed to say that he’d like to go discuss this big decision with his wife first, before literally running out the clinic. Undaunted, a few evenings later, the person gets another call from the doctor’s secretary, to know a date for the surgery. This time, the person was past a few pegs of liquid courage at his club. He unleashed hell on of the secretary, saying he wouldn’t go there even if he really needed surgery. Turned out he didn’t need surgery after all. Then there was a patient who consulted 2-3 specialists, all of whom strongly recommended surgery. Finally, he consulted a very senior specialist who is not part of the increasing filth in the profession. The doctor clearly stated that no surgery was required, and instead prescribed a few simple exercises. These are just a few of probably tens of thousands of such stories that have been surfacing over the world in recent years. Patient fear, trust, vulnerability and urgency are what corrupt doctors and surgeons are using to feast on patient money. And there is no rock-bottom for these soulless doctors. Another friend recently visited Ojas Eye Hospital for a routine eye check up. She never got to meet the doctor her appointment was scheduled with. However, the person, presumably a technician who conducted some routine checks and pressure tests on her eyes, told her the readings were off normal. He asked her if there was a condition of blindness in her family. She has good vision, and when she repeatedly confirmed no such problem in the family, the person, told her that her optic nerves seem permanently damaged, and that she would go blind soon. He also went on to say that no money could prevent it. He then asked her to come the next day for some more tests. Luckily, the next day she got another opinion which quashed this horrific diagnosis. But for each such person, imagine how many others have, and are undergoing unnecessary tests and expensive surgeries, only to feed the greed and whim of a doctor. A doctor in whom they place all their trust, with an unwavering confidence that the doctor would do everything with their best interest in mind. Astronomical medical school fees, corruption in admissions, as well as greed are some obvious reasons for the current rot in the medical profession. However, isn’t it interesting that the last line of the original Hippocratic oath spoke of a strong consequence in case one breaks this oath; while the same has since been diluted to sound more like a choice or an option in the later version? Could that be a reason that so many doctors now take the more unscrupulous route? A father-son duo were my family doctors till their unfortunate passing a few years ago. The senior doctor, in his day, was one of the most respected physicians in Mumbai. He had once jokingly, yet very matter-of-factly, told my father that unfortunately, most poor people beyond Mahim/ Bandra do not have their appendix. What he meant, was that even the slightest of stomach aches among the poor, was an opportunity by killer doctors to perform an unnecessary appendectomy for the little money that the poor could afford, or needed to borrow for the operation. Such practices will only end when the law becomes strict enough to state that if a doctor carries out unnecessary surgeries or organ removals, one organ of the surgeon will be taken and donated to someone on the organ wait-list. That should help take some pressure off the list too. The title, ‘primum non nocere’ translates to ‘first, do no harm’, one of the promises within the Hippocratic oath. If you liked this post, do subscribe here on my blog for similar topics that encourage reflection and discussion.